1. How Does Stellar Work? Stellar is an open-source protocol for sending and receiving money. It supports fiat currencies (such as U.S. dollars and euros) as well as cryptocurrency, and it works for transactions between people located in different countries as well as for local transactions. The tokens used on the Stellar network, lumens, are abbreviated as “XLM” on cryptocurrency exchanges. You may sometimes hear people use the word “stellar” to refer to the tokens but, technically, this usage is incorrect. Stellar was originally based on the Ripple protocol and model. Stellar’s chief goal is to make the process of exchanging one type of currency for another as painless, fast and affordable as possible, even for people who don’t have access to traditional banking networks. Stellar does this by recording currency exchanges on a distributed ledger using the Stellar protocol. On its own, this would not make Stellar very unique or interesting. Lots of other blockchain protocols, like Bitcoin, also record transaction data to a distributed ledger. However, unlike Bitcoin and many other blockchain protocols, Stellar uses a consensus protocol that does not involve mining or proof of work. Instead, the Stellar consensus protocol uses a concept called “federated Byzantine agreement” (FBA). FBA achieves consensus by allowing nodes on the Stellar network to vote on the state of data recorded on that network. Using a multitiered, federated voting model, FBA voting is effective in achieving network-wide consensus in a short time. 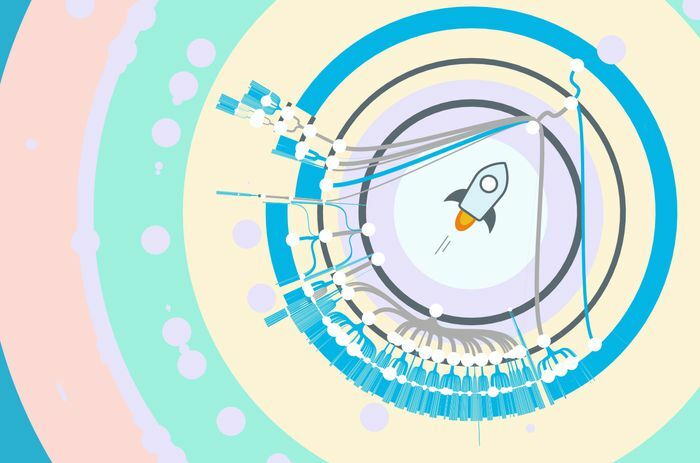 Because of the speed with which data transactions can be confirmed using Stellar’s FBA-based consensus protocol, the Stellar network can confirm a new transaction in about five seconds. In contrast, it typically takes up to an hour to fully confirm a bitcoin transaction. The Stellar consensus protocol also helps to keep transaction costs low on the Stellar network. Registering a new transaction expends very few compute resources, therefore Stellar transaction fees (which are paid in lumens) are the equivalent of only fractions of a U.S. penny. As noted above, another core feature of Stellar is its support for exchanging virtually any type of fiat or cryptocurrency for another. Stellar is able to do this because its network operates essentially as a decentralized cryptocurrency exchange that connects people who want to trade different currencies with each other. The Stellar protocol and network power this decentralized exchange, but in order to access it, you have to run a stand-alone application, such as StellarTerm or Stellarport. Stellar is often compared to Ripple, another protocol that boasts very fast transaction speeds. Stellar and Ripple were founded by the same person, Jed McCaleb, and the architectures of both protocols are similar. However, Stellar’s differences as compared with Ripple are that Stellar is developed by a noncommercial organization called the Stellar Development Foundation, whereas Ripple is developed by a commercial entity, Ripple Labs. Stellar is also fully open source. Ripple’s protocol is open source, but other parts of the platform are not. Thus, generally speaking, Stellar is more open and decentralized than Ripple. Depending on your point of view, this may give Stellar an advantage over Ripple.